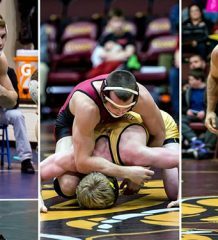 The Gannon University wrestling team hit a small bump in the road last week as the Knights fell to Division II’s 10th-ranked team, the University of Pittsburgh-Johnstown, 24-9, Saturday at the Hammermill Center. The Mountain Cats, ranked No. 2 in Super Region One, opened with two victories and a forfeit to build a 12-0 lead and that proved to be the difference in the Pennsylvania State Athletic Conference dual meet. 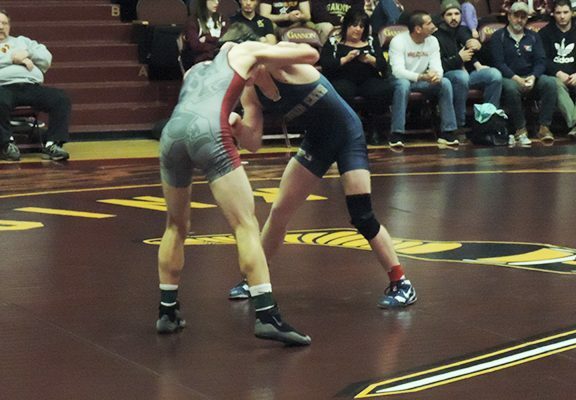 Gannon fell to 3-2 overall and 2-2 in conference dual meet action going into Friday’s 7 p.m. battle with East Stroudsburg at the Hammermill Center. Coming away with victories for the Knights in the matchup with Pitt-Johnstown were sophomore Giovanni Ciotti at 149 pounds, redshirt senior Garret Smith at 165 and redshirt sophomore Nicholas Costa at 184. Ciotti, ranked No. 8 in Super Region One, trailed Pitt-Johnstown’s Corey Falleroni, 6-2, at the start of their match. But Ciotti was able to bounce back in the third period with a reversal and then followed to pick up the four-point near fall at the end of the match to post a 9-8 victory. Smith, currently ranked No. 6 in the region, started his match with a fierce takedown of UPJ’s Steve Edwards in the first period. After another takedown and escape, Smith took the match, 5-3. Costa, ranked No. 4 in the region, figured to have a close match, as his opponent, Levi Niebauer, was ranked No. 7.That fact did not faze Costa though, as he opened the bout with a quick takedown followed by a four-point near fall. The second period started off strong for Costa with another takedown and two-point near fall to be up 10-3, but unfortunately would give up two stalling warnings. Costa answered in the third though by getting three points off an escape and takedown combo, and he went on to claim a 13-11 decision after being off the last two months due to injury. 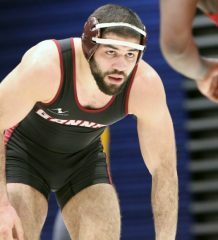 Gannon wrestled without 133-pound standout Carmine Ciotti, who is ranked fourth nationally and No. 1 in the region. Friday’s meet with East Stroudsburg figures to feature some very close matchups seeing how the Warriors have four regionally ranked wrestlers. The meet could see regionally ranked wrestlers going head-to-head in three weight classes, as Gannon boasts John Marotto, ranked No. 7 at 141 pounds; Eric Lewandowski, ranked No. 3 in the region and 12th nationally at 157 pounds; and Costa at 184 pounds. Both Marotto and Lewandowski lost against Pitt-Johnstown, with Marotto falling, 3-2, to Chris Eddins and Lewandowski dropping a 10-3 decision to Cody Law. Following Friday’s meet, Gannon will be participating in Sunday’s Jamestown Jayhawk Open in Jamestown, N.Y.
my go's daddy just got Ford Focus Sedan just by some part time working online with a laptop.